I’m happy to share with you our first newsletter of 2015. In January, we learned of a staggering new estimate from an article in The Lancet that projects lives lost in 2030 by the leading risk factors in 2010. A projected 1.7 million people will die from road traffic crashes in 2030, compared to the current figure of 1.24. The time is now for countries to put an end to preventable road crashes. At the start of the year in Vietnam, the National Traffic Safety Committee launched the National Child Helmet Action Plan. The Action Plan aims to reach 80% child helmet-wearing rates by 2016 and is a powerful step for Vietnam towards improved motorcycle passenger safety. In Cambodia, the Road Traffic Law—in which all passengers are required to wear helmets—was approved and signed by the King on January 9, 2015. AIP Foundation looks forward to supporting the enforcement of this law. With the strong coalition of road safety stakeholders in support of this progress, I am hopeful we will reach improved helmet use rates and fewer deaths on the roads in 2015. Please see below to read more about our latest activities. 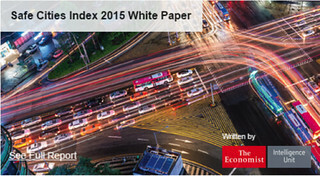 The Economist Intelligence Unit has released a paper ranking the safest cities in the world. In their “Safe Cities Index 2015 White Paper,” 50 cities are ranked on more than 40 metrics within four main categories: digital security, health security, infrastructure safety and personal safety. Ho Chi Minh City, Vietnam ranked 3rd from the last overall, coming in at #48. In the category of "infrastructure safety" (the quality of roads, number of disaster-related deaths, etc. 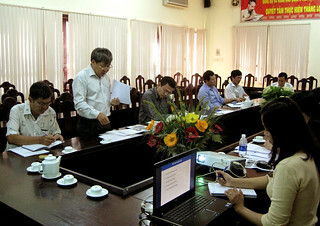 ), Ho Chi Minh City finished last. Foreign Policy, a prominent and leading international source for global news, has featured an article titled, “Death Rides a Moto”. The article is written to coincide with the new traffic laws in Cambodia but also elaborates on the growth of motorcycles across Asia, fatalities in Thailand, and sub-standard helmet use in Vietnam. The article features a video with AIP Foundation’s Cambodia Country Director, Mr. Pagna Kim, who discusses current motorcycle issues in Cambodia and AIP Foundation’s programs. AIP Foundation is implementing “Head Safe. 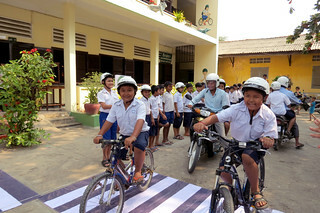 Helmet On.” to address helmet safety in Cambodia through behavior-change campaigns, school-based helmet safety programs, and advocacy for legislation enforcing helmet use. 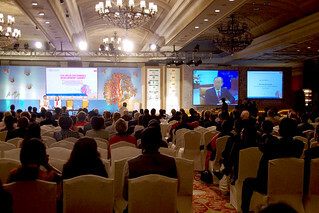 AIP Foundation’s Development Director Mr. Colin Delmore had the opportunity to present AIP Foundation’s work at the 15th Delhi Sustainable Development Summit under the thematic track “Safe and Clean Transport for Sustainable Cities.” The session focused the contemporary discussion of ‘SMART’ cities on ‘safety.’ The panelists also stressed that transport should include a holistic approach integrating urban planning, policy measures, and urban sustainability. 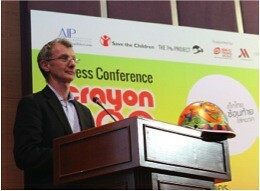 Three large review workshops took place to discuss the Johnson & Johnson supported Helmets for Kids program. Attendees reviewed 2014 program results, lessons learned over the past three years, and plans for 2015. In total, 246 local representatives from the Traffic Safety Committee, Department of Education and Training, and Traffic Police were present with parents and teachers. Eleven schools received awards for successful program implementation and for having the highest helmet wearing rates. AIP Foundation saw significant stakeholder engagement and ownership of the Helmets for Kids program across the provinces and is encouraged by the strong support for the continuation of Helmets for Kids. AIP Foundation organized a capacity training workshop supported by the Global Road Safety Partnership (GRSP), with financial assistance from the Bloomberg Philanthropies, for 44 policymakers and journalists from Binh Duong, Long An, and Tay Ninh Provinces. The capacity trainings provided attendees with detailed knowledge on Vietnam’s child helmet situation, legislation, and implementation. 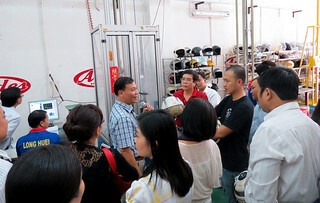 During the training, participants visited Long Huei helmet manufacturer to better understand standard helmets by observing the entire process of producing quality helmets: from the testing laboratory to helmet assembly lines to the final product packaging. All participants agreed that the program provided them with useful information and is a way to strengthen the bond between NGOs, local government, and relevant traffic safety stakeholders. The National Traffic Safety Committee (NTSC), Vietnam’s governmental authority on road safety, has launched a National Child Helmet Action Plan to promote child helmet use across the country. 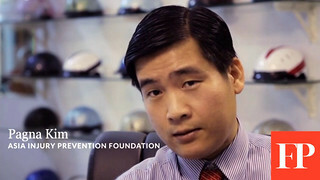 The National Child Helmet Action Plan is coordinated by the NTSC and its department members, and is supported by many organizations, including AIP Foundation. The Action Plan seeks to raise public awareness and create a transformational shift in the attitude towards child helmet use and regulation using the key message “Love your child, provide a helmet.” Main activities include public awareness-raising and mass media communications on child helmet use, school-based education, and increased police enforcement on a national scale to crack down on violations of the child helmet regulation. As a part of the long-term Safe Kids Walk This Way program in Vietnam, Deputy Director of the Standing Committee of HCMC Traffic Safety Committee, Vice Chairman of District People’s Committee, and other officials attended the first Safe School Zone Working Committee Meeting in January. The Safe School Zone project educates nearly 1,300 students on pedestrian safety, makes infrastructural modifications to school zones, and collects and analyzes hospital injury data in order to improve the pedestrian situation for children. 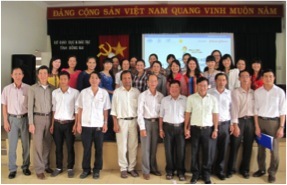 The project advocates for the Safe School Zone model to be implemented in schools across Vietnam. At the meeting, the results of school surveys conducted in July 2014 were presented and three schools were chosen for Safe School Zone implementation. Attendees successfully advocated for asphalt spread in front of one of the surveyed schools, which were completed before the Lunar New year to help students travel safely. AIP Foundation President Mr. Greig Craft has been awarded with the Certificate of Merit by the Da Nang People’s Committee. 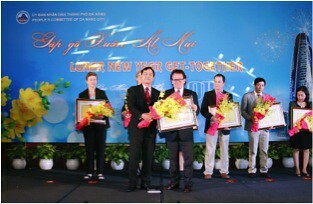 The award is in recognition of Mr. Craft’s “active contributions to the socio-economic development of Da Nang and enhancing the friendship and cooperation between Da Nang and foreign partners in 2014.” On February 6, 2014, a ceremony was held in Da Nang to award individuals and organizations with Certificates of Merit. 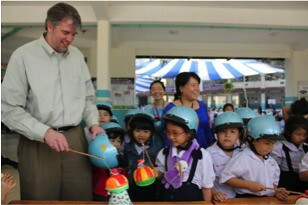 A helmet-themed Traffic Safety Day festival was held at Truong Dinh Primary School in District 12, educating 867 students on road safety through a variety of interactive festivities. As part of AIP Foundation’s Helmets for Families program, the event included road safety activities that reinforce reinforce previous interventions. This is the second year that Helmets for Families, supported by Abbott, is enforcing quality helmet use among students and their parents. The festivities were attended by a delegation from Abbott Headquarters, including Mr. Bert Mohrdieck, Manager, Global Commercial EHS, Global Engineering Services, Abbott Commercial Operations; Mr. Joseph McKillips, Sr. Manager, Commercial Program Support, Global Environment, Health, and Safety, Abbott; and Mr. Mike P. Ha, EHS Manager, Global Commercial Fleet Safety & Global Ergonomics, Abbott Vascular. Students thoroughly enjoyed playing and competing in road safety activities with these special Abbott visitors. Cambodia's King Norodom Sihamoni has signed off on a more robust traffic law, completing the final step for legislation that could hit the streets as early as next month, according to the government’s National Road Safety Committee (NRSC). The bill sailed through the National Assembly in a few days of debate in December and passed the Senate just before the New Year. Among other changes included in the law, passengers who are older than 3 years and riding on a motorbike will now have to wear a helmet. 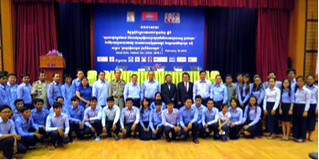 To support the implementation of the new Road Traffic Law, which was officially enacted on January 29, traffic police attended a workshop in Phnom Penh to develop a nationwide action plan for the enforcement of the passenger helmet law. In December, two senior traffic policeman visited Ho Chi Minh City, Vietnam and Singapore in order to hear experiences and lessons learned from traffic police on the subject of passenger helmet use enforcement. 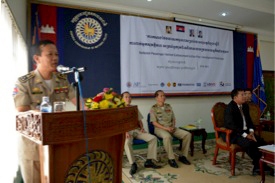 Traffic police who participated in the study tour, organized by AIP Foundation, shared their experiences at the workshop along with police from national and provincial levels to discuss how these best practices can be developed into an action plan applied across Cambodia. In January 2015, AIP Foundation conducted the first post-intervention helmet observations at the 18 schools targeted by the “Head Safe. Helmet On.” project, supported by USAID-DIV and others, as well as six control schools. 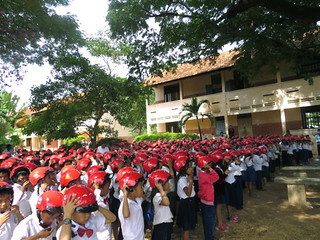 The observation took place at each school approximately two weeks after the ceremony or event where students and teachers received their helmets. Across the 18 target schools, average student helmet use rates increased from 0.4% in the pre-intervention observation to 89% in the first post-intervention observation. However, student helmet use rates at the six control schools remained low from 0.5% to 2%. The second post-intervention helmet observation will be conducted 10-12 weeks after the ceremony or event at each school. UYFC and AIP Foundation representatives sign a Memorandum of Understanding. On February 10, the Union of Youth Federations of Cambodia (UYFC) announced their formal working partnership with AIP Foundation to reduce fatalities and serious head injuries among vulnerable motorcycle passengers—including children—in Cambodia. The announcement was made official through a Memorandum of Understanding between the two parties, taking effect from February 2015 to December 2016. View photos from the MoU signing here. 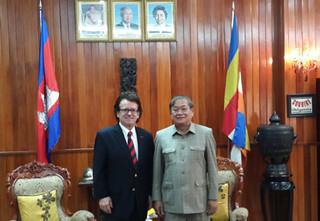 On February 11, AIP Foundation President Mr. Greig Craft met with His Excellency Khieu Kanharith, Minister of Information in Cambodia. The meeting took place following a communications campaign stakeholder consultative meeting. H.E. Kanharith will co-organize a workshop for media on road safety and the new traffic law in the near future with the Ministry of Public Works and Transportation. The Minister of Information in Cambodia supports AIP Foundation’s goal increasing passenger helmet rates in targeted communes of Phnom Penh, Kandal, and Kampong Speu to 80% by 2016. AIP Foundation delivered extra-curricular road safety activities to approximately 300 students from Aknu Wat Primary School, supported by Manulife (Cambodia) Plc. The activities focused on the importance of helmet use and involved a drawing contest, question and answer games, and pedestrian, bicycle, and motor-vehicle safety lessons. The students were enthusiastic about learning life-saving skills and were committed to sharing these road safety lessons with family and peers. Furthermore, AIP Foundation coordinated with the American Intercon School (Toul Kork Branch) and arranged a seminar for approximately 300 staff and students focusing on the recently approved Road Traffic Law. 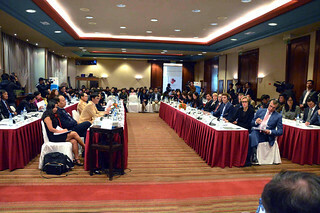 In November, Kevin Watkins, Executive Director of the Overseas Development Institute, attended The 7% Project campaign launch while on a fact-finding visit to Thailand. While there, AIP Foundation arranged for Mr. Watkins and Road Safety Ambassador Michelle Yeoh to meet with a father whose 13-year old son was killed in a motorcycle crash without a helmet. Mr. Watkins wrote an article in the Bangkok Post about his visit, discussing this meeting, the campaign, the road safety situation in Thailand, and his thoughts on child helmet use. Read his article: "Slap on a helmet, keep your child safe on the road." 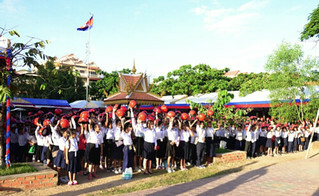 Students from Intarumphun-Anusorn School received 612 high-quality helmets in association with Thailand’s National Children’s Day. 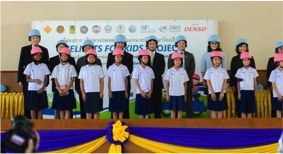 The helmet donations, organized under Helmets for Kids and with support from DENSO International Asia Co., LTD (DENSO) and the Road Safety Fund, were provided to promote helmet use and road safety awareness. Prior to helmet donation, helmet use rates for students traveling by motorcycle or bicycle were observed to be 0%. These rates have increased to 54% after only two weeks of program intervention. Two of AIP Foundation’s Helmets for Kids schools in Udon Thani, Nong Samrong Wittaya and Ban Nakwang Wittaya, have been selected as model schools by the Province of Udon Thani based on their efforts and success in implementing school road safety programs. A ceremony was held to hand over a certificate to each of the two schools on January 15, 2015. Three Helmets for Kids schools (Chomchonnakwang, Chomchonmoomon, and Nong Samrong Wittaya) supported by Vespiario (Thailand) Co., Ltd. participated in extracurricular activities in January. 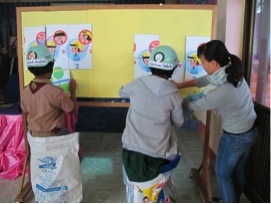 These activities reinforce helmet use after a helmet donation that was previously been during the school year. In total, 619 students played games on traffic laws, traffic signs, and steps for wearing helmets properly. In January, AIP Foundation visited 37 Walk Wise project schools to test students’ learning and understanding of road safety. 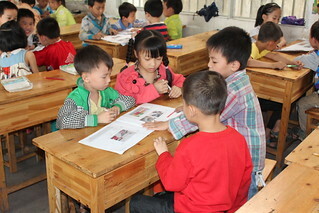 Along with road safety knowledge, the questionnaire asked about the road safety environment around schools, students’ road safety behavior, and their main means of transportation. By the end of February, 2015, AIP Foundation had received around 30 finished forms. This information is important in order to work to improve road safety around schools. It costs 8 million Ugandan Shillings (USD $2,747) on average to treat just one severely injured motorcyclist at Mulago Hospital, according to a new study by the Uganda Christian University in partnership with Makerere School of Economics. To manage these cases, Mulago Hospital directs 62.5% of its surgery budget to treating victims of boda crashes, says Barbara Mwanje, Regional Manager of AIP Foundation in Africa, which operates under the Global Helmet Vaccine Initiative (GHVI).